At that time, he wasn’t even sure if the highest court in the Commonwealth would accept the brief, because of the words “gay” and “lesbian”. When I became GLAD’s Executive Director last year, the organization had already had ongoing conversations about adopting a new, more inclusive name. While we wanted everyone we serve to be able to see themselves in our name, we also wanted to honor our proud history. Gay & Lesbian Advocates & Defenders had been chosen by our visionary founder, John Ward, in 1978 for the purpose of proudly saying the words “gay” and “lesbian” in our name, at a time when very few other organizations did. It was imprinted in our DNA not only to change the laws, but to make our community visible, especially within the legal system where invisibility was the norm. Eventually, GLBTQ Legal Advocates & Defenders emerged as the leading candidate – a name that would both honor our past and explicitly make visible that GLAD has always fought for bisexual, transgender, and queer people as well. 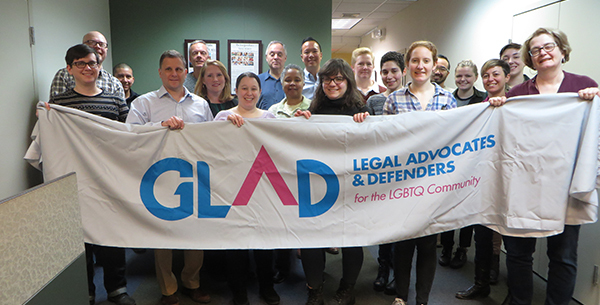 GLAD is now GLBTQ Legal Advocates & Defenders. Our name is new, but not our mission. Check out this short video to learn more about how GLAD is moving equality forward #FORALL. Even still, I like others had to adjust to the proposed new name, especially the inclusion of the “Q”. I grew up gay in rural upstate New York, and was bullied and called a “queer” in high school. The word still holds some of that meaning for me. Finally, before we were ready to move forward, I wanted to ensure that I honored GLAD’s past by reaching out to John Ward. We will always be GLAD, and we will always have your back. Inspired? Make a gift to support GLAD’s important work at this exciting moment!